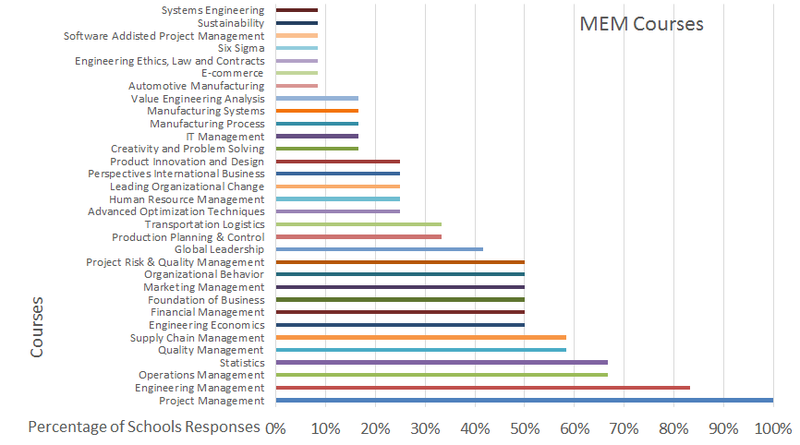 Over the past month, ENGINEERING.com has collected data from Masters of Engineering Management programs all around North America. Within our survey, we asked schools what courses they offer in an attempt to determine a pattern – and now we’re ready to share our results. As expected, the programs have a focus on management and the top three courses in the survey were: project management (100%), engineering management (80%) and operations management (65%). What is surprising, however, is the group of courses that made it to the bottom of the list. In a world experiencing massive booms in the IT industry, it is surprising to note that only 16% of Master of Engineering Management programs offer an IT management course. While it is true that Universities need time to catch up with changing trends, the IT boom is hardly new. Furthermore, it is my understanding that a good manager will promote innovation and design. However, only a quarter of the programs surveyed offer a course in product innovation and design. I find this a bit short sighted, as even if students are not working on product innovation itself, such ideas and thinking can be brought to other areas of the business with fantastic results. I believe that the lack of IT and design courses also constitutes a skill gap within the course selections. Other skill based courses I am shocked to see near the bottom of the list include manufacturing process and manufacturing systems. Perhaps the programs are looking to marketing management to pick up some of the technical slack? After all, 50% of the schools have a marketing course, and in the growing digital world everyone has to be a little bit of a marketer. Perhaps this course is where Master of Engineering Management programs hope to get future managers ready for the digital age? It should also be of no surprise that there is a clear focus on business in Master of Engineering Management. Finance, economics, organization, operations, and leadership figure prominently. A quarter of the schools surveyed even have a human resources course. Master of Engineering Management programs still have a focus on the technical though – statistics, quality, supply chain, risk management and production planning all made their mark in our analysis. This suggests that as an engineering manager your focus will shift more towards business but you will likely hang onto your technical side too. After all, good business decisions aren’t just gut reactions and often require large amounts of data analysis. It is also important that a manager have the knowledge and ability to aid the engineering team in the design, implementation, testing, and optimization stages. For even when you become a manager, you never cease to be an engineer.